The mighty crew at Portland's Periscope Studio has completed their "100 Wolverine" covers! 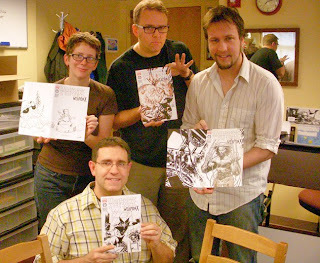 Pictured above, clockwise from 12 o'clock, that's: Jeff Parker, Dustin Weaver, Steve Lieber, and Colleen Coover. You can get nifty-swell close-up views of these covers and more here. So whatchoo waiting for? SNIKT!